Mystery Lovers' Kitchen: Peppermint Bark! The bark that's better when you bite! Peppermint Bark! The bark that's better when you bite! can whip some up yourself? evenly with a rubber spatula. nibblers that live in your house. have a pact because no one is talking. Happy Holidays to nibblers big and small! Available in just 24 days!!! 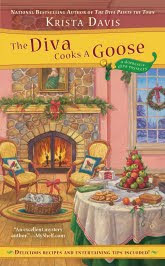 The Diva Cooks a Goose, she's holding a Christmas cookie recipe contest! It ends on December 13th, so be sure to get your winning cookie recipe to her in time to win some fabulous cookie cutters! Submit your recipe to Krista at KristaDavis dot com! Jenn, this sounds so easy! It's probably a good bit less expensive to make it at home, too, especially when you add the cost of shipping. Thanks for such a creative idea! I love your nibblers, too. My aunt always said there was no point in baking Christmas cookies ahead of time because no matter where she hid them, the nibblers found them. 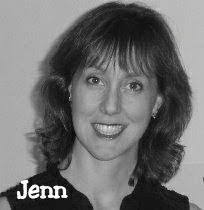 Jenn, these look so pretty in your pictures! Very festive. The nibbler problem appears to be widespread; I swear the pile of goodies I baked and stored in my freezer before surgery was much higher than it is now--and they're all blaming the cat. These are gorgeous. I just love peppermint bark! Genius to make it yourself! Just the perfect holiday treat to nibble on. I think you've just put a worm in my brain! What a pretty treat! I absolutely love peppermint bark--one of my favorites! Good luck keeping your kiddos away from the goodies! These look awesome. Good for you for not waiting! I bought a package of the new Nestle's dark chocolate mint chips on sale. Might try bark with them. with toffee...hmmm. I see more bark variations in the offing. Thanks so much for this lovely recipe and for giving me the perfect gift idea for our newspaper delivery person (I have no idea of this dear person's name...all I know is that the paper is ALWAYS at the end of the driveway waiting for me!! ), the mail lady, and the trash guys!! Your photos are gorgeous as well!